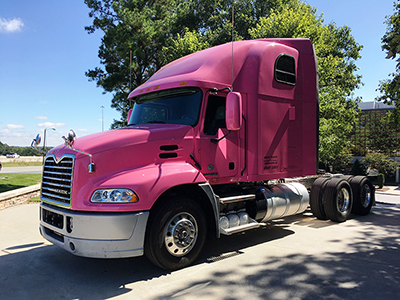 Posted on 25, October 2016 by EuropaWire PR Editors | This entry was posted in Automotive, Healthcare, Non Profit, Society, Transportation & Logistics and tagged axle back model, breast cancer awareness month, Mack Trucks, pink Mack® Pinnacle™, Volvo. Bookmark the permalink. GREENSBORO, NC, 25-Oct-2016 — /EuropaWire/ — Dedicated to quality, reliability and total customer satisfaction, Mack Trucks, Inc., has provided its customers with innovative transportation solutions for more than a century. Today, Mack is one of North America’s largest producers of heavy-duty trucks, and Mack® trucks are sold and serviced through an extensive distribution network in more than 45 countries. Mack trucks and diesel engines sold in North America are assembled in the United States. Mack manufacturing locations are certified to the internationally recognized ISO 9001 standard for quality and ISO 14001 standard for environmental management systems. Mack is also a proud sponsor of Share the Road, an American Trucking Associations’ public information campaign aimed at enhancing the safety of our nation’s roadways.